I think it’s important to give back and help younger designers coming into the marketplace – so when I was invited by Bristol Art School to be a visiting lecturer on their Fashion and Graphics courses it gave me an opportunity to see what I could do to help. 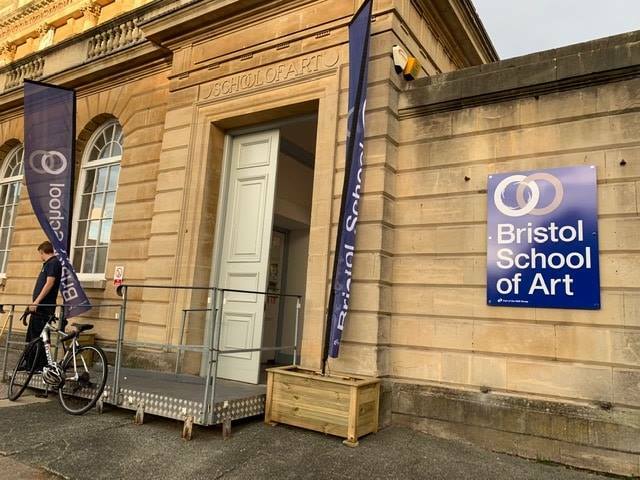 Bristol Art School is a real hidden gem – a traditional Art School in the middle of the buzzy urban hotspot of Bristol….. When I discussed with the Tutors at the School what they would like me to contribute… they said they would be grateful if I would just start by telling the students about my career to date. Well I sat down and started to write out a bullit list in chronological order and was frankly bemused by the amazing number of things I had done – from being a young fashion designer making his way in the early 80’s with my own collection of ladies separates and selling to Harrods and Pop stars and top end Boutiques in London, New York and Japan – to being one of the very first fashion designers to invest in Computer Aided Design. Gosh that cost a lot – I remember my first two computers, printer and plotters cost £32,000! I could have bought a house instead.. I always believed in being an early adopter and it’s led to my having a willingness to invest and take risks to be the best I can. And no interesting designer has a linear career path – I have designed everything from ladies top end fashion to fast fashion, technical sports and outdoor gear to my current fascination with purposeful bag and luggage. It’s been a great creative journey. if there is one thing that I really believe in – it’s that young designers need to be taught how money and economics are so important in design. There is no point in designing something that won’t sell – and so having a good understanding of marketing, how brands are built and how the money works to bring your product ideas to life is so important. Clearly there is still a need to help young creatives understand how they fit into the marketplace – and how they can make themselves relevant and benefit from the value of their ideas in partnership with entrepreneurs. I will always give young designers some time to help them – I dearly wish I had had more practical help at the beginning of my career. If any educational institutions want a realistic and commercial designer to mentor any of their students – just get in touch. This is personal post from Guy Mathiot Oct. 2018.